With the tagline "enlightening babies through all stages", Lamaze is one of the many age-specific brands distributed by Tomy in the UK. Lamaze toys are designed to help babies 'learn and discover' with the help of the 'right toy at the right time'. The company's innovative and colourful Lamaze baby toys are designed to amuse and stimulate your child's senses. Based around their Infant Development System, Lamaze toys consist of three key developmental themes: Awakening the senses, exploring and experimenting, and moving and doing. Different colours, textures and sounds are used to not only create enjoyment, but also to help very young children develop their essential skill set. 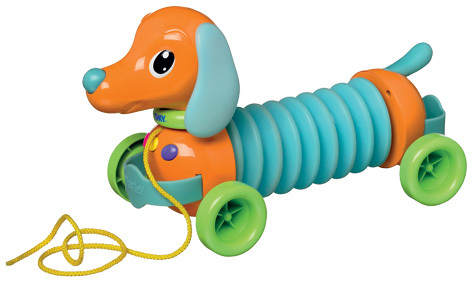 We particularly like one of the most striking Lamaze toys that is called the Stack, Roll and Crawl Ball. Although at first glance it might look like a regular stacking toy, once all the pieces have been stacked correctly it turns into a crawling ball, complete with rattle on top! Search for this and many other Lamaze toys at the recommend shops below.